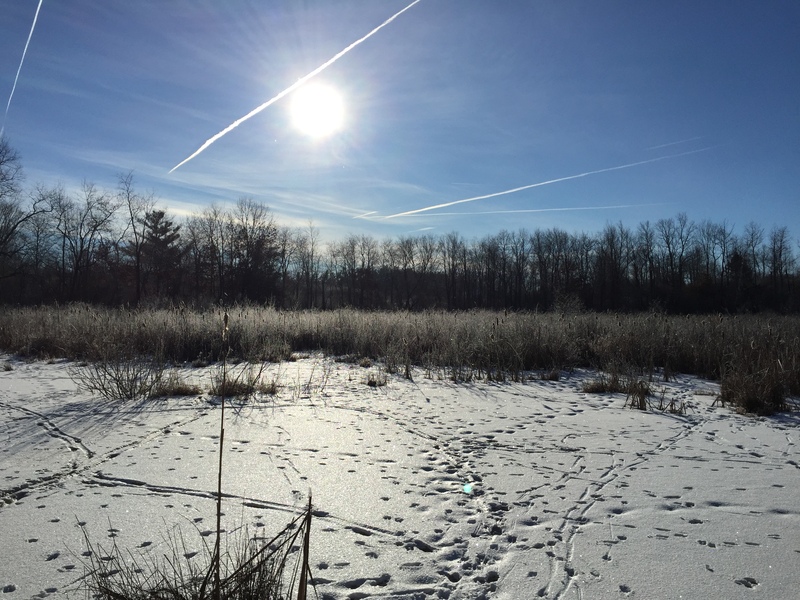 When clear, deep blue stretches across the sky in Michigan in January, it is time to get outside. Fortunately, our weekly Wednesday bird walks offered a great excuse to do just that. 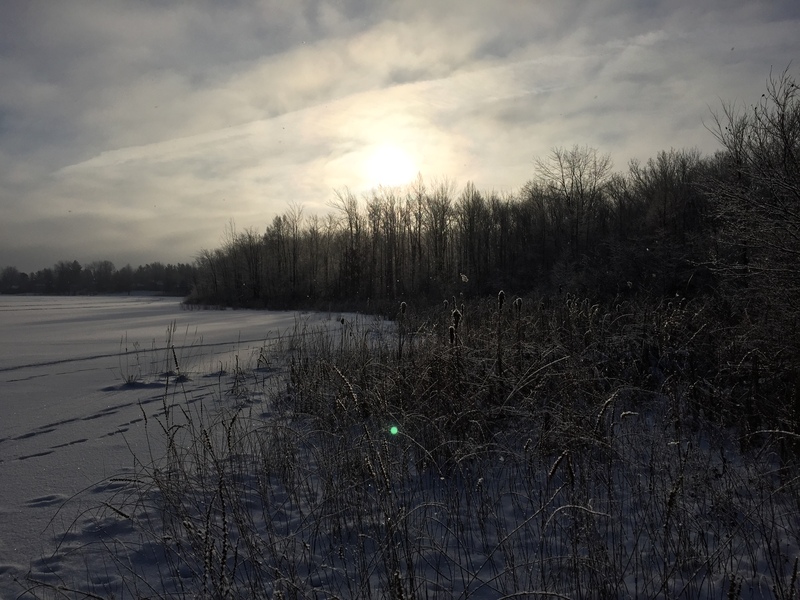 We started out at Bear Creek Nature Park on January 7 on a chilly morning. The walk began quietly, but as the sun rose birds began to move and call until we were busy hunting down the sources of loud hammering, persistent chip notes, and musical calls. 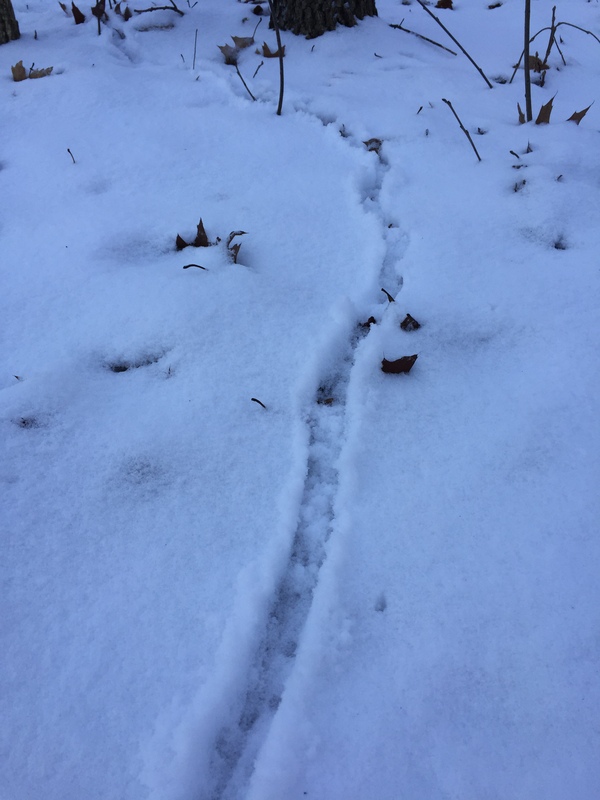 Fresh snow on the ground captured the path of a small mammal forging through the snow. Paths in the winter snow at Bear Creek Nature Park. On January 14 at Cranberry Lake Park we were treated to a thick frost covering the surface of every twig. Ice crystals hanging suspended in the frigid air sparkled as the sun filled them with light. In addition to many of the usual birds we were treated to the calls of a Great Horned Owl in the distance. The third Wednesday of January we birded in a snow squall at Lost Lake Nature Park, so I didn’t get any pictures. But this past Wednesday, January 28 at Draper Twin Lake Park was another morning with beautiful blue skies. I snapped this picture as we tried to locate some pesky birds hiding in the underbrush along the eastern wetland. Animal tracks mark the snow and vapor trails from jets cross the sun. People and animals still need to get places when it is cold! We’ll be out birding again in February. Remember that I do have a few pairs of extra binoculars that you can borrow for the bird walks. If the weather is nice I usually stick around after the bird walk to remove invasive shrubs for a few hours. You’re welcome to join me. Check out the January Bird Report if you’re interested in the complete list of birds we were able to identify this month. Hope to see you out there next week! I love the bird lists! I’ve never seen (or known I’ve seen) a golden-crowned kinglet or a rough-legged hawk (could I be confusing them with sharp-shinned hawk?) and I don’t really know the call of a great horned owl – though just before sunset two days ago, the silhouette of one swooped down through the trees outside our kitchen window. We went outside to look on the ground – but no luck. Hope the doc lets me go next month on at least some of these walks!